Let us first examine the concepts of direct and indirect election. In all republican governments except pure democracies (where all people vote directly on all issues), power is delegated (entrusted) to individuals to act in behalf of others. These individuals are known as delegates. To represent the interest of an individual, delegates are optional; to represent the interest of a group, they are indispensable. We intuitively understand this concept for delegates who will legislate (law makers). It is not as clear (or acceptable) when we consider delegates (electors) who vote in indirect elections. Under the Articles of Confederation the interests of the people were only represented indirectly; the state legislatures chose the delegates to represent the interest of the States. The Framers of the Constitution wanted to retain this indirect representation, but wanted to also add direct representation. For this reason they designed one branch of the new government, the House of Representatives, to represent the interest of the people. The protection against the evils of democracy that Mr. Gerry identified was that the positions in the other branches of government would be filled using indirect elections. The only branch of the national government the people would vote for directly was the House of Representatives. by the Senate representing the interest of the state governments. Senators were to be appointed by the state legislatures. Presidents and judges were not to be directly elected by the people either. John Jay in Federalist No. 64 explained the wisdom of the Convention in the superior method of electing both the President and the Senators by select bodies of delegates (electors) who would “in general be composed of the most enlightened and respectable citizens” in an indirect form of election. The Framers intelligently designed the United States to be a complex constitutional representative republic not a democracy. Today, we do not consider the concept of protecting separate and sometimes conflicting interests. The Framers developed a method to select the best presidents possible. Now democracy (direct elections or popular vote) is assumed to be the only “fair” way to elect presidents as well as members of both branches of the national legislature. A brief look at the caliber of candidates and the nature of the campaign rhetoric and tactics the current methods have produced at all levels should send us searching for a better method. In our opinion, the original Constitution had the answers. 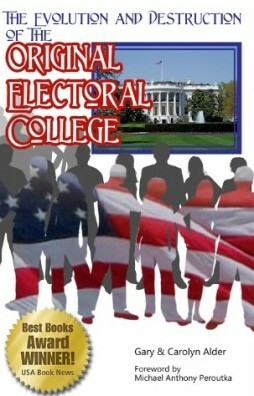 This book focuses on presidential elections.